30 fun filled minutes of music, movement & song carefully crafted to hold your little ones attention. A little of their time will be spent preparing for your child’s magical NYT on stage… ! theatre experience. Along with older children, they will have a unique chance to take part, have great fun and know that mum and dad will be watching too! A fun based, action packed activity hour incorporating dance, singing & drama. Focusing on confidence building, working as a team & the basics of performing. Each term the tots will feature in a theatre performance. Each week, the children will gain in confidence and will learn the basics of performing and working as a team. Each week every child will be encouraged to express themselves with new& exciting drama games that are specifically designed to help the young performer grow in confidence. At the end of term, they will join older children to take part in a fully staged performance where parents, friends and the general public can buy tickets and attend. With 3 performances per year, there are new shows to look forward to and new songs and dance routines to learn. A 2 hour rehearsal period covering all aspects of theatre performance – singing, acting, dance & movement. These rehearsals will result in a theatre performance at the end of a term or two terms depending on the length of the production. The rehearsal session incorporates singing, acting & movement - performing shows specially designed for the young performer. At the end of each term, each child will be able to take part in a fully staged performance at a local theatre. A number of New Youth Theatre Junior shows such as Disney’s Cinderella and Jungle Book, Aladdin & Annie keep every child interested & looking forward to their next performance. Tickets for the shows are available to parents, relatives and the general public. Come along and enjoy the show!! A three hour rehearsal period covering all the disciplines of theatre performance – singing, acting & movement. These rehearsals will result in a theatre performance at the end of each term. Each child will learn musical theatre skills, how to develop character parts and the understanding of how a theatre production works. A number of full length shows such as Annie, High School Musical and Fame play to packed houses and standing ovations. Tickets for the shows are available to parents, relatives and the general public. 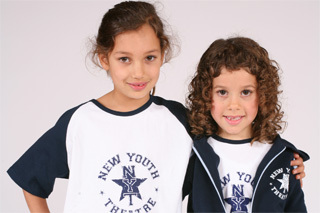 Some members of New Youth Theatre have played in professional performances and have made television appearances.